Thinking of buying on Charleston Lake? We'd be happy to take you out on a boat tour of our beautiful lake. There's just so much to see out there. Feel free to contact us and we'll arrange it. Charleston Lake is located in South Eastern Ontario, just north east of Gananoque. The lake is carved out of the Frontenac Axis, a relatively narrow extension of the Canadian Shield bedrock which dominates the landscape of Northern Ontario. The lake is the principal watershed for the Gananoque River, and boasts prime fishing locations. 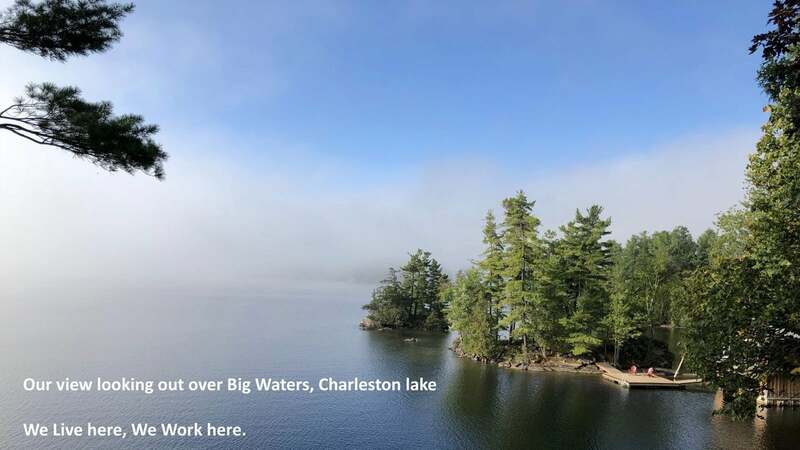 Charleston Lake has over 100 miles of shoreline and over 100 islands with over 800 summer and permanent residences on the lake. The water surface is 26.2 km2, and the maximum depth is 91.1 m. A naturally occurring rock and tree formation shows a profile of the guardian of Charleston Lake known as Indian Head.